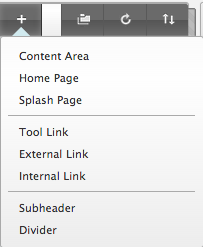 You can easily add new menu item to your site's left-hand menu. Content areas are the menu item types which are most commonly used. They allow you to add (and remove) various types of content, including files, folders, web links, tests, surveys, assignments, wikis, blogs and RLOs. However, if you want students to be able to access a discussion board, staff contact details, announcements, or their grades, then you need to add a tool link instead. To delete an area from the Site Menu, hover over the item until the downward chevron is seen, clicking on this will give you a range of options including delete and changing availability.